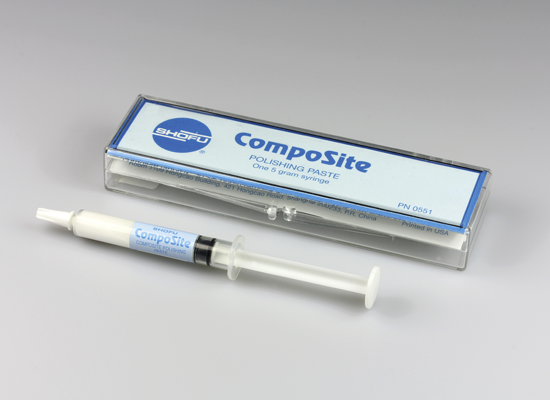 The CompoSite polishing paste is comprised of smooth polishing cream with submicron aluminium oxide abrasive particles to provide a long-lasting, brilliant shine on both anterior and posterior restorations. Chairside: For polishing composite restorations in the patient’s mouth the optimal results are achieved by using CompoSite polishing paste in combination with Super-Snap Buff Disk and Super-Snap Buff Mini-Disk. After completion of the finishing and prepolishing sequence (e.g. with Super-Snap disks or CompoSite polishers) apply a small amount of the polishing paste directly to the centre of a moistened Super-Snap Buff Disk or Buff-Mini Disk. To reduce splatter, spread the paste in a thin, even layer on the felt disk and polish the adjusted surface by using light buffing strokes at slow speed (less than 10,000 rpm). Keep the paste moist throughout the polishing procedure. After polishing remove any residual paste with water spray.